Although some might argue that it's not fair to compare a pre-packaged frozen dish purchased at a grocery store to similar food served in a restaurant, I think there comes a time when one should go ahead and make that comparison. In particular, when the price tag of a pre-packaged frozen food item starts getting up into the range of what you'd pay while dining out, then I say compare away. 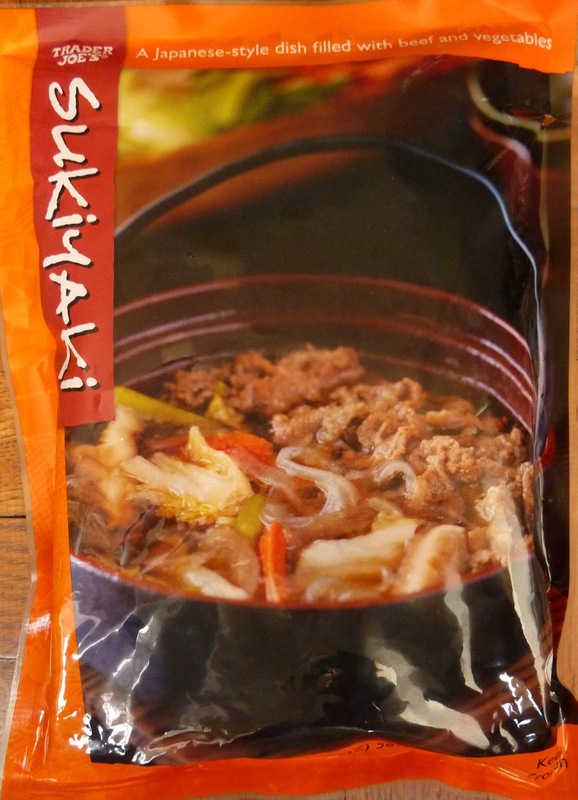 This bag of sukiyaki was $6.99, and the portion size was just about what one might expect from a restaurant. Sure, it was enough dinner for both Sonia and I, but most entrees we buy at restaurants turn into two meals for us as well. And while you might pay an extra dollar or two for this type of thing at a Japanese restaurant, you're also having it prepared and served by someone else, and there are usually some extra bells and whistles like rice or miso soup on the side. So the question I'm asking myself is, "Was it restaurant quality?" First, I'll start off with something positive: the sauce. The sauce was amazing. Excellent. Delicious. It was savory, thick, rich, and slightly sweet. Containing real sake rice wine and mirin, it was bursting with flavor. I've never had anything quite like it. The dish wasn't spicy at all, but I didn't find myself wanting to dump sriracha all over it like I usually do with non-spicy Asian foods. I don't think a bit of sriracha would have ruined it, but I didn't want to upset the flavor of this amazing sauce. It permeated all of the ingredients and added to their natural tastes. The veggies were plentiful and had nice textures. There were big pieces of carrots, napa cabbage, shiitake mushrooms, and something called burdock. The noodles were made of mung bean flour. They were flat, long, and clear. I've had similar noodles in Asian dishes before, and each time I have them, I'm surprised how chewy they are. I usually wind up gnawing on them for a bit before I get so frustrated that I simply swallow and wind up taking down a much longer strand of noodle than I intended to. Surprisingly, there wasn't a lack of meat—one of the more common problems we've found with TJ's frozen food bags. The worst part was that the beef was much more chewy than the noodles. It was fatty, too. There were big chunks of white fat all through the meat, and it was quite rubbery. In this case, I would have preferred tofu chunks—or at least very lean beef. The meat tasted fine, especially once it soaked up all that yummy sauce. It was just too chewy. I ate the food with chopsticks, and I found myself attempting to bite a piece of meat in half with my teeth while yanking on one end with the sticks a couple times. As I stretched and pulled on the beef, sauce dribbled down my chin, and I even lost my grip on the chopsticks at one point—allowing the slab of meat to dangle from my lips like a dog running off with a piece of raw bacon. It almost ruined the experience for me. Almost. But I'll be danged if that's not some deeeelicious sauce. I give this product 3 stars. It would have been much higher had the meat and noodles not been so rubbery. Sonia gives it 3 stars as well for the same reasons. She also thinks there are too many onions in the mixture. I guess I'm just a bit more into onions than she is, because I disagree on that point. But double 3's it is. I believe the bag said serving size is 1 cup and 4 servings per package. ^ my guess is 2 servings, but just a guess. (Yeah, I'd eat the whole package, so this is important!) I do want to try this, but still not at my (NYC) TJ's. Tried it over rice. Pretty good. A tad bit too sweet for my palate however. Would get it again. The sauce was amazing. Next time I would definitely put it over rice (as my husband suggested we do. I was really disappointed it said there were 4 1 cup servings in the bag. No way were there 4 cups of anything in that bag. It was perfect for 2, though if you're not big eaters. Try this one again. I've had this 5 times now and only one package had the "bad" beef you mentioned. The rest of them were just fine. Also, I've "spiced" it up a bit by adding peas, more mushrooms, garlic, celery salt, and egg (move the stuff to the sides and drop it in the center of the broth right about two minutes before taking it off the heat and then scramble it like you would with egg drop soup). With the price tag and the addition of so much else, it's not really worth the cost involved - but it sure is delicious. This tasted fabulous, but when I looked at the refrigerated leftovers, there was an enormous amount of solidified fat I had to remove. I added a raw egg to it while it was cooking. Fatty or not, it was so damn tasty, I would buy again. 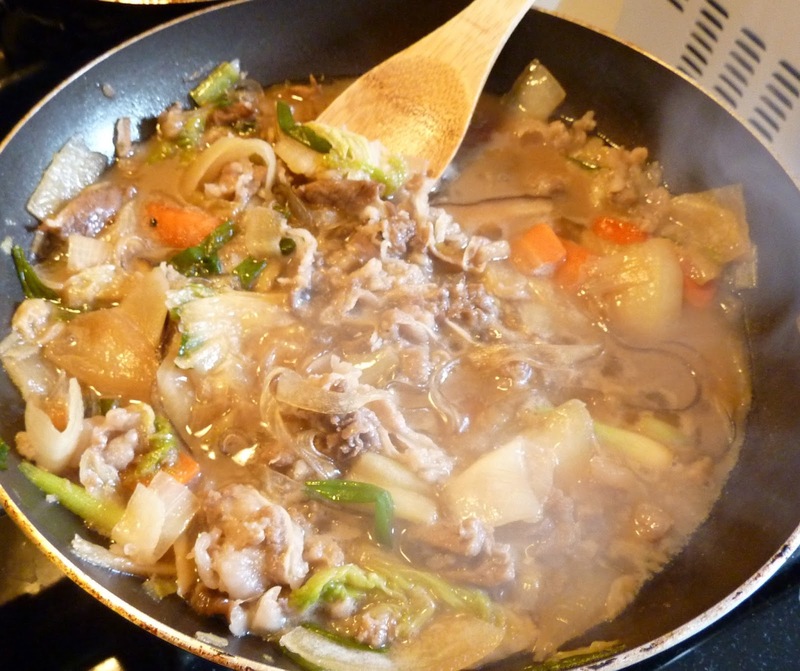 The beef in my example was beef tripe, Not very appetizing. So, I think the main problem with this is that the instructions on the package leave out one important extra ingredient -- a cup of water! Add that when preparing, and you'll get much better results.